49ers center Weston Richburg and cornerback D.J. Reed both recently underwent surgery, leaving their availability for the start of training camp in question, San Francisco announced today. Richburg’s operation addressed an ongoing knee issue, while Reed went under the knife to correct a shoulder injury. 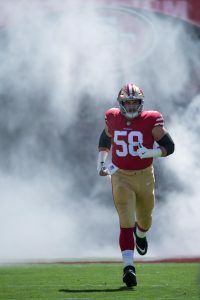 Richburg inked a five-year, $47.5MM contract with the 49ers last offseason, and proceeded to play in 15 games despite dealing with his knee injury. His production wasn’t great, as Pro Football Focus assigned Richburg the lowest grade (51.9) of his five-year career, but it’s fair to assume his health questions factored into his reduced level of play. Although Richburg could return for training camp, knee injuries can often last longer than initially expected. The 49ers don’t have a ton of depth along the interior of their offensive line, so they could potentially be in trouble if Richburg is forced to miss any regular season action. Erik Magnuson would presumably take over at center, but San Francisco could look to free agency and/or the draft to shore up their line in case Richburg isn’t ready for the 2019 campaign. Reed, a fifth-round pick last year, appeared in 15 games (two starts) for the Niners. At 5’9″, 188 pounds, he’s mostly suited for the slot, and that’s where he primarily played in 2018. All told, Reed saw action on roughly a third of San Francisco’s defensive snaps and 43.2% of the club’s special teams plays. In addition to signing Marcus Davenport, the Saints also inked Florida State offensive tackle Rick Leonard (Round 4, pick 127), Wisconsin safety Natrell Jamerson (Round 5, pick 164), Boston College cornerback Karmin Moore (Round 6, pick 189), Louisiana Tech running back Boston Scott (Round 6, pick 201), and LSU center Will Clapp (Round 7, pick 245), The Advocate’s Nick Underhill tweets. The Cardinals continued to ink their draft picks to deals, signing Fordham running back Chase Edmonds (Round 4, pick 134), cornerback Christian Campbell (Round 6, pick 182), and offensive tackle Korey Cunningham (Round 7, pick 254). The Giants followed suit, signing UTEP guard Will Hernandez (Round 2, pick 34), Georgia linebacker Lorenzo Carter (Round 3, pick 66) and Richmond quarterback Kyle Lauletta (Round 4, pick 108). The Panthers also inked cornerback Rashaan Gaulden (Round 3, pick 85) and linebacker Andre Smith (Round 7, pick 234). The Bills added another signing in Weber State cornerback Taron Johnson (Round 4, pick 121). The Bengals were also busy, tabbing cornerback Davontae Harris (Round 5, pick 151), defensive end Andrew Brown (Round 5, pick 158), quarterback Logan Woodside (Round 7, pick 249) and guard Rod Taylor (Round 7, pick 252). The 49ers signed their fifth pick so far in the offseason, inking Kansas State defensive back D.J. Reed (Round 5, pick 142). The Patriots added a slew of draft picks to the ranks, signing linebacker Ja’Whaun Bentley (Round 5, pick 143), linebacker Christian Sam (Round 6, pick 178), wide receiver Braxton Berrios (Round 6, pick 210), quarterback Danny Etling (Round 7, pick 219), cornerback Keiron Crossen (Round 7, pick 243), and tight end Ryan Izzo (Round 7, pick 250). It sounds like Jon Gruden and Derrick Johnson hit it off in a one-on-one meeting, which led to the Raiders signing the 14th-year linebacker earlier on Friday. Johnson’s deal is a one-year agreement, Terez Paylor of Yahoo.com reports, adding that it’s worth up to $3MM. Gruden looks to have been a Johnson fan for a while during his years as ESPN’s Monday Night Football analyst, and that intel may have played a key role in the 35-year-old off-ball ‘backer landing with Oakland. The Chiefs’ all-time leading tackler, Johnson has not played in a 4-3 defense since the 2008 season. Prior to the Chiefs switching to the 3-4 look in 2009, Johnson worked as an outside linebacker with Kansas City during his first four seasons. The Raiders signed Tahir Whitehead as well. He, Bruce Irvin and Johnson could be the Raiders’ three linebacker starters, despite Johnson telling Paylor he’s not quite the same player he was since the second of his severe Achilles injuries shut him down late in the 2016 season. Gruden, though, did not rule out a NaVorro Bowman reunion (Twitter link via Scott Bair of NBC Sports Bay Area). Bowman is nearly six years younger than Johnson but also carries injury baggage. However, Bowman graded as Oakland’s best linebacker by a wide margin last season. The Raiders have maintained they’re still interested in Bowman throughout the offseason, but they’ve now added four linebackers — with Emmanuel Lamur and Kyle Wilber coming to California as well — since Bowman became a free agent. The Raiders began their rookie minicamp with Kolton Miller working at left tackle, where he’ll likely be Donald Penn‘s backup. Gruden confirmed the team’s first-round pick will start his career there, per NFL.com’s James Palmer (on Twitter), despite the team being in need of an immediate right tackle starter. Third-round pick Brandon Parker will work at that position. Maurice Hurst Jr.‘s been cleared for workouts and participated in the first day of the Raiders’ minicamp. Gruden said (via Bair, on Twitter) the team doesn’t have any reservations about the Michigan product, whose heart issues played a major role in him sliding into the fifth round. Gruden believes the Raiders landed the top two interior pass rushers in the draft in Hurst and second-round pick P.J. Hall, per Michael Gehlken of the Las Vegas Review-Journal (via Twitter). The 49ers plan to move third-round pick Tarvarius Moore from cornerback to safety, Matt Barrows of the Sacramento Bee notes. The Southern Mississippi alum ran a 4.32-second 40-yard dash at his pro day, and his 6-foot-2 frame also makes John Lynch believe he could stick at corner. Interestingly, 5-9 safety D.J. Reed — an outside corner at Kansas State — will compete with K’Waun Williams for the slot job, per Barrows, but also practice at safety. San Francisco’s brass is clearly unafraid to shuttle its defensive backs around, having Jimmie Ward ready to potentially switch positions for the fourth straight offseason. Would-be third-year DB Dexter McCoil broke a bone in his foot training independently, leading the 49ers to waive him with an NFI distinction, Matt Maiocco of NBC Sports Bay Area tweets. A 16-game Charger participant in 2016 and having played eight games with the 49ers last season, McCoil is facing a four- to six-week recovery period, per Maiocco.